I have some stamps that are stuck on old letters and was wondering how to get them off. Thank you! Are the stamps stuck to the letters? Or the envelope. If the stamps are stuck to the envelope, you can cut around the stamp - then in hot water let the stamps sit in the water for a few seconds until you can peel the stamp away. I do this method with stamps when I accidentally don't need to mail anything because I bill pay already. I just tried it with a blow dryer and it worked. Put the hair dryer on high heat and blow on the stamp until it gets hot enough to loosen the glue. Carefully peel the stamp up while blowing medium heat on the glue as you peel. It only took a minute or so for me to remove this stamp. This method also works great for removing labels from plastic containers and other purchases you make. I am a generous giver, but resent monthly requests after Ive given once for the year. I am Turing the stamps off the envelopes and will return them unused to the post office in exchange for usable forever stamps. Most of the methods stated will work at some time or other but my question would be why are you wanting to remove the stamps? Stamps on mail that has been through the USPS cannot legally be removed and reused. You can hold the letter over a boiling teakettle and steam the stamp off. 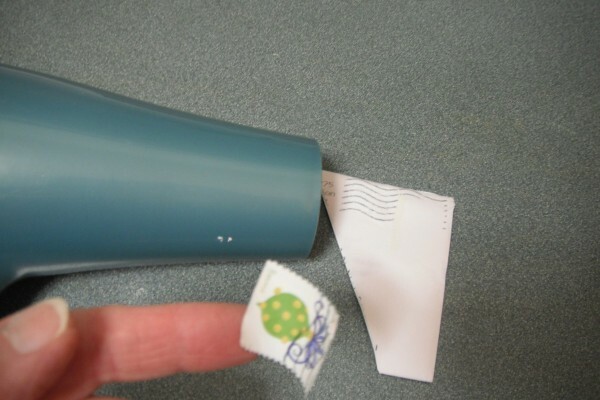 You can put a few droplets of water on the stamp and put it in the microwave for 15-20 seconds. You can try putting it in the freezer overnight. The next day use a knife to slide them off. Our post office told me to cut around them and then reglue to the new envelope. My old post office where I used to live, let me trade in some for new stamps after a toddler stuck them all on 1 envelope.